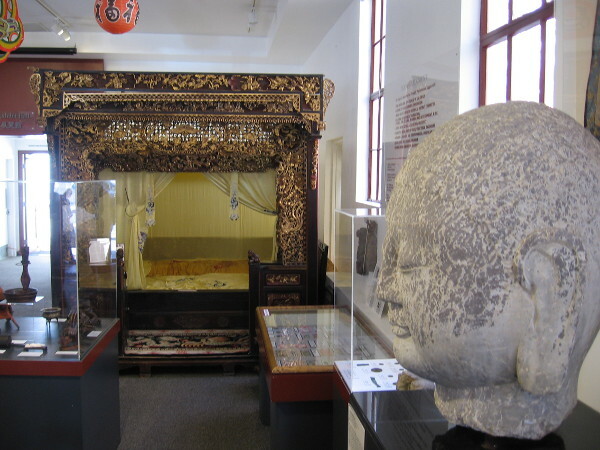 Photos inside the San Diego Chinese Historical Museum. – Cool San Diego Sights! 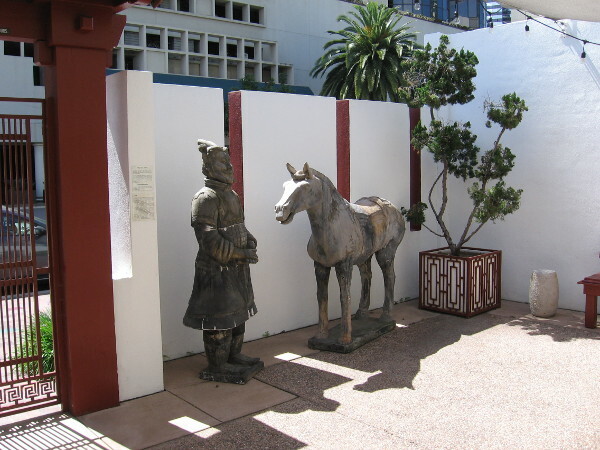 Photos inside the San Diego Chinese Historical Museum. 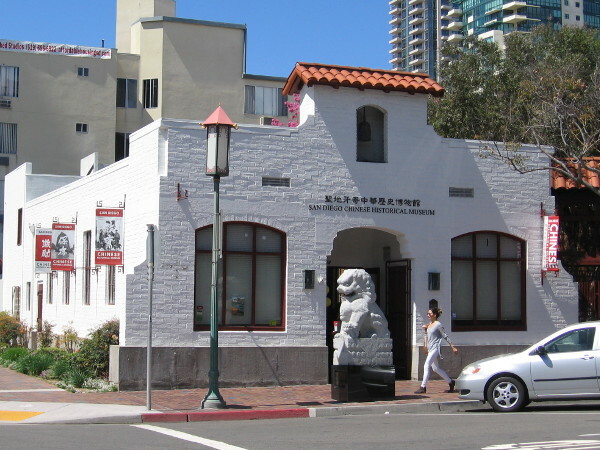 The San Diego Chinese Historical Museum is a cultural gem in downtown’s small Chinatown. 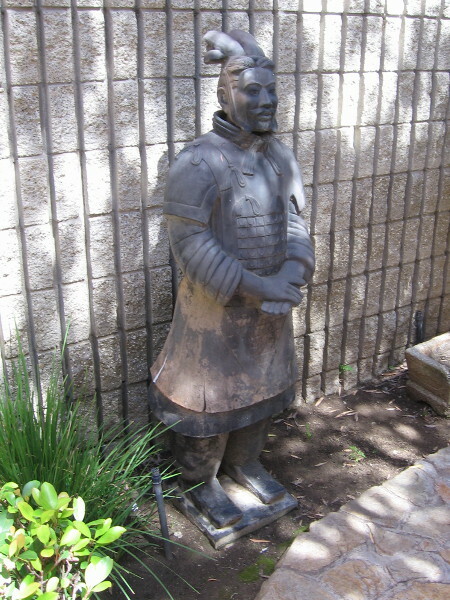 I recently enjoyed a visit to the San Diego Chinese Historical Museum. It’s located downtown in San Diego’s Asian Pacific Historic District. I was graciously allowed to take some photos of the indoor exhibits and the peaceful outdoor garden. Built in 1927, this Mission Revival style building was originally the Chinese Community Church in San Diego’s Chinatown. It was saved from demolition in the 1990’s, and relocated to its present location. The museum might be small, but it overflows with an important slice of San Diego history. 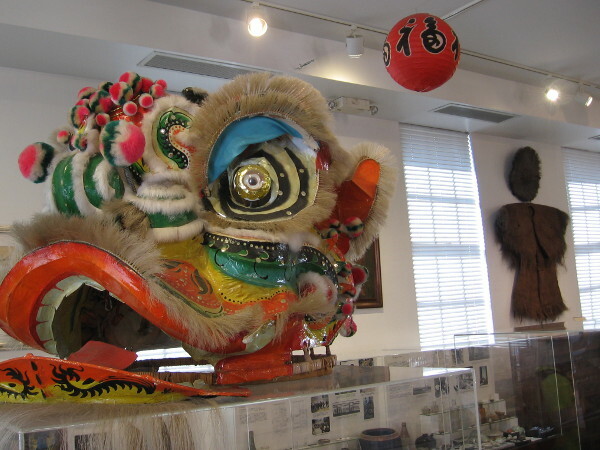 Its many colorful artifacts representing Chinese culture will fascinate your eyes at every turn! I recommend a visit! 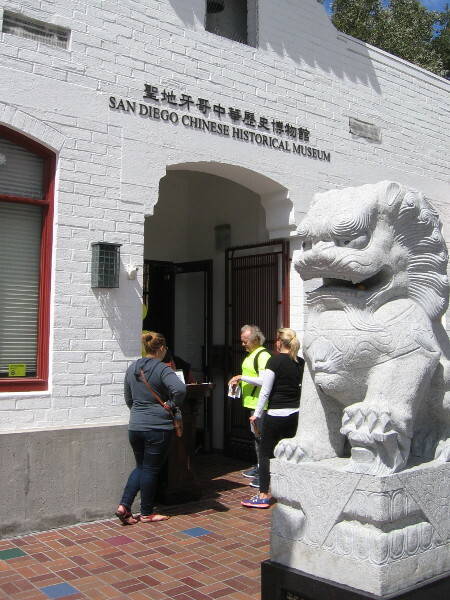 Visitors enter the San Diego Chinese Historical Museum during the San Diego Architectural Foundation’s OPEN HOUSE 2017. Many colorful sights await inside the small historical and cultural museum. 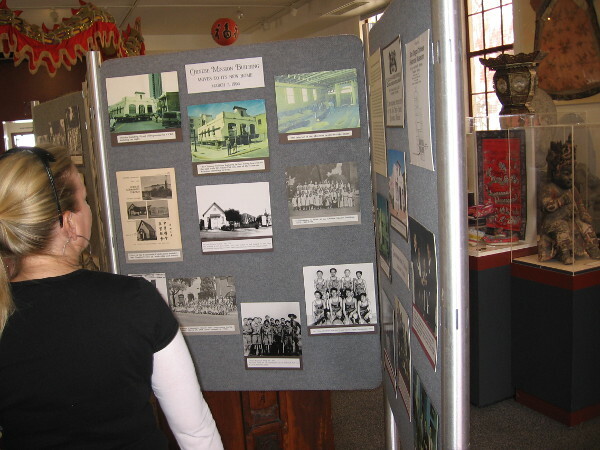 Someone looks at old photos of San Diego and Chinese residents who helped to build and grow our city. 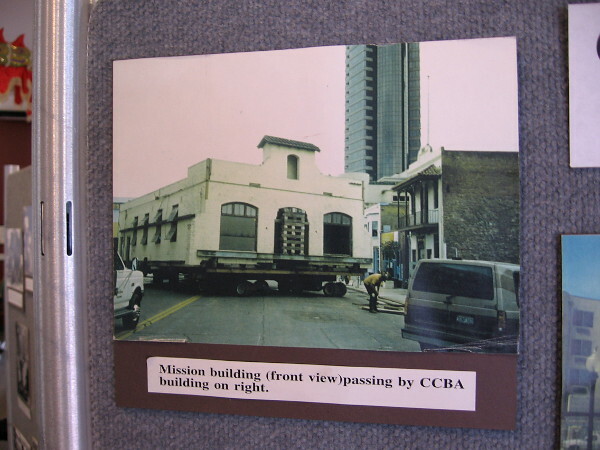 The museum building was originally a mission, which was moved to its present location in San Diego’s Asian Pacific Historic District. Extensive archaeological work has been performed in this area, including the block south of the museum. 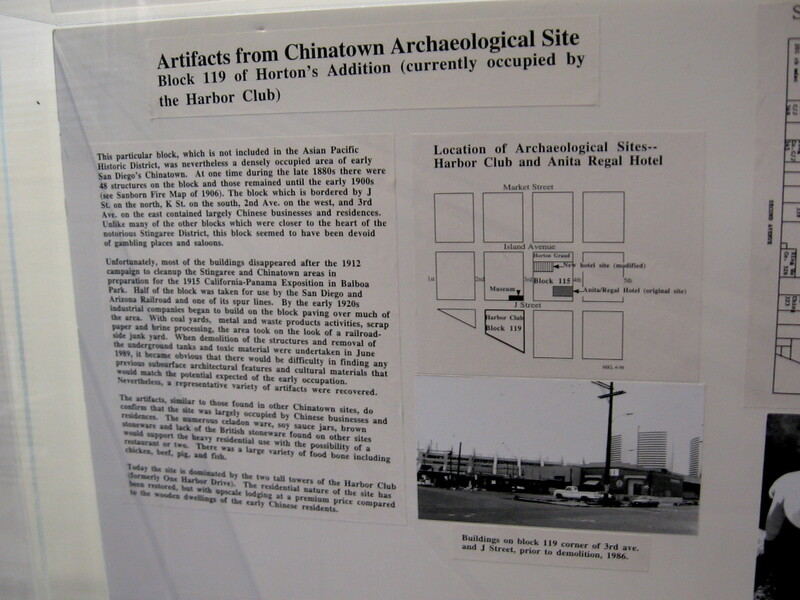 Many artifacts from old Chinatown have been recovered. 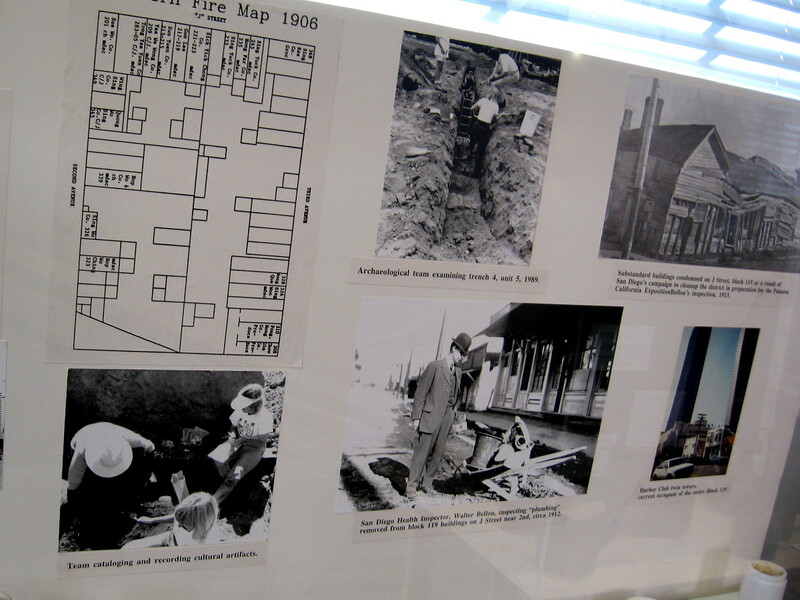 Old photos show archaeological digs in the neighborhood. 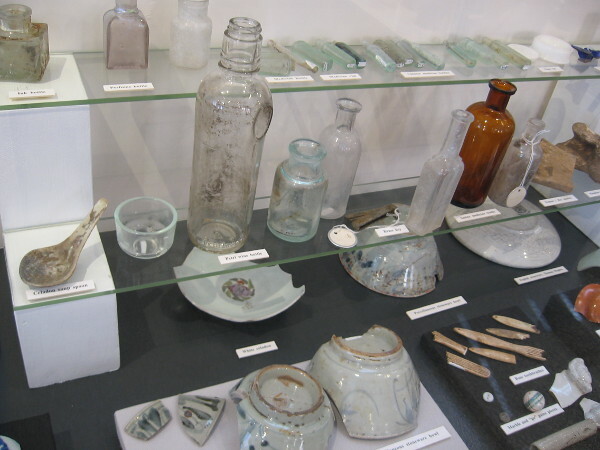 Some of many artifacts recovered include glass bottles, ceramic bowls, utensils. 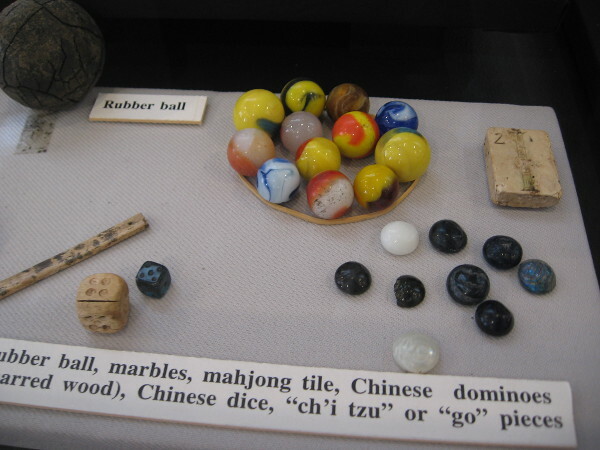 Objects used in everyday life include a rubber ball, marbles, mahjong tile, Chinese dice and go pieces. 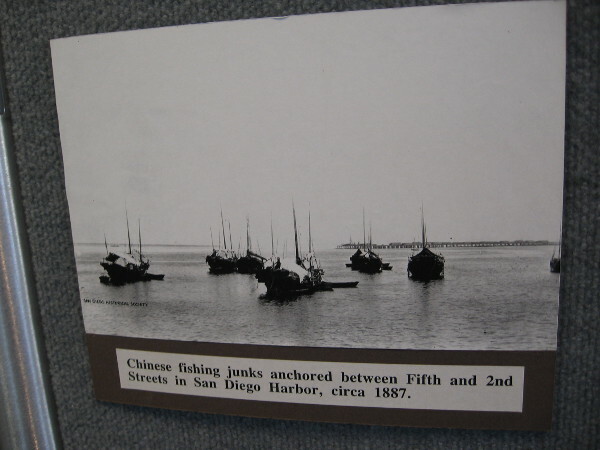 Historical photograph of Chinese fishing junks anchored in San Diego Harbor around 1887. 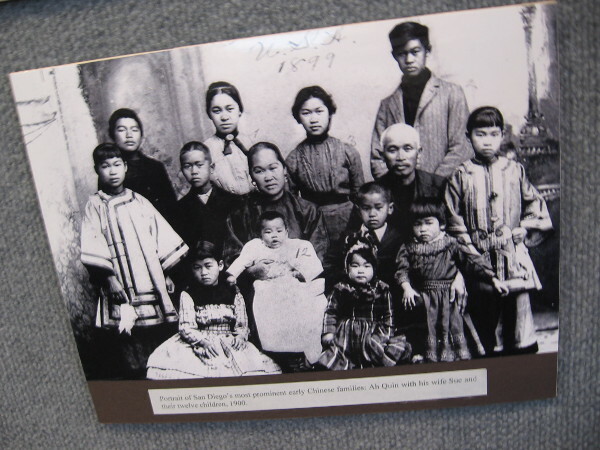 Portrait of the Ah Quin family, one of the most prominent, influential early San Diego Chinese families. 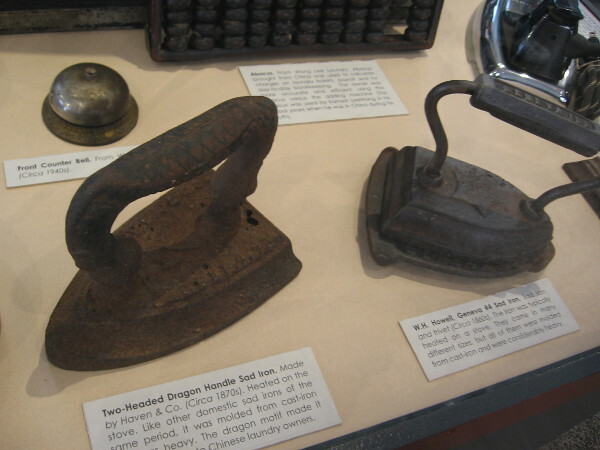 Chinese laundries in San Diego utilized irons, counter bells, an abacus, and other useful objects. 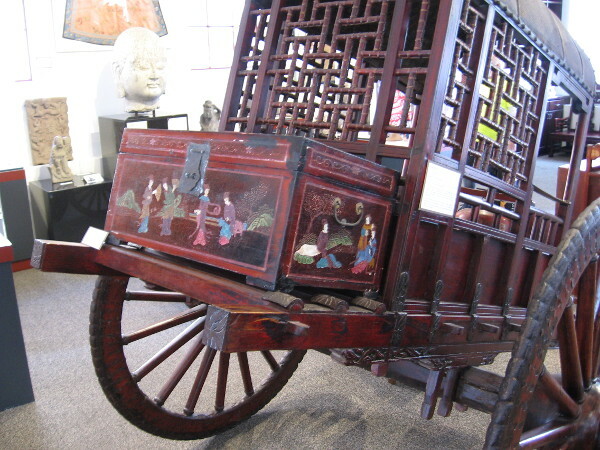 A bridal carriage from the late 1800s made of rosewood, found in Yun Cheng. 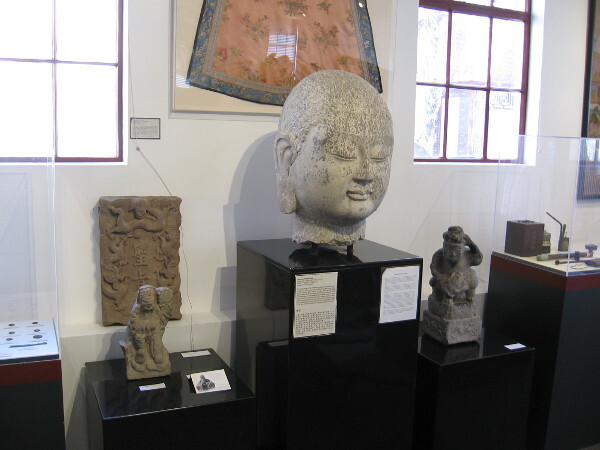 The limestone Buddha head of the Northern Qi Dynasty, was originally carved into a cave in Shanxi Province. 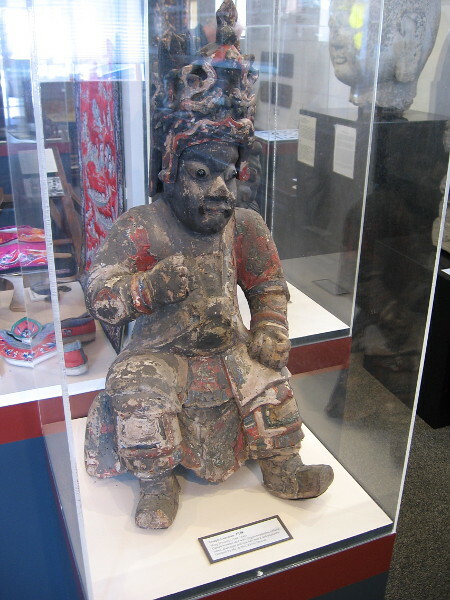 A temple guardian, from Ming Dynasty. The carved wooden idol has a dragon headdress, robes, glass eyes and a real hair beard and mustache. 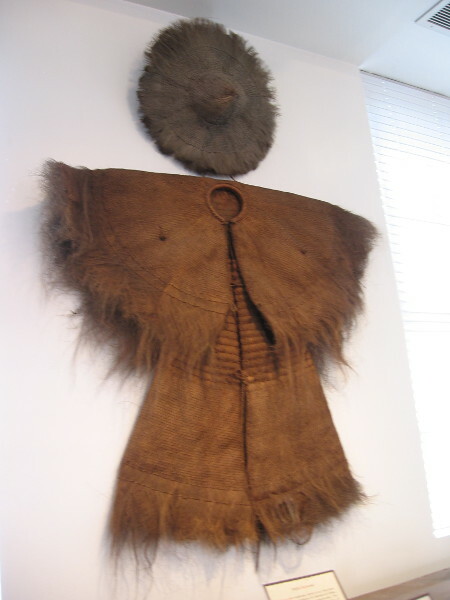 A palm raincoat, called so yee, worn by fishermen and farmers for centuries in China. 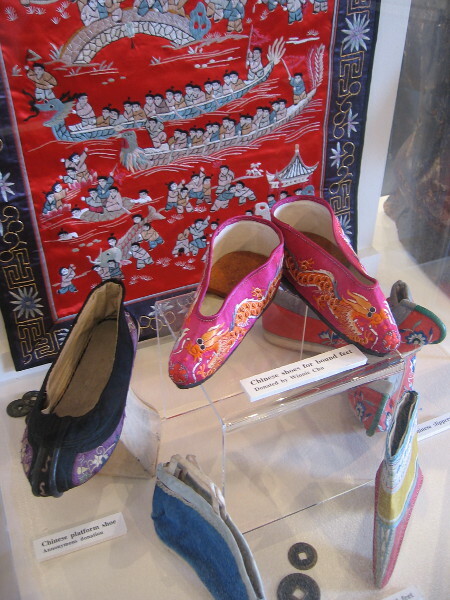 Colorful woven art, and Chinese shoes and slippers for bound feet. Looking past the Buddha head at a fantastic, ornate alcove bed. 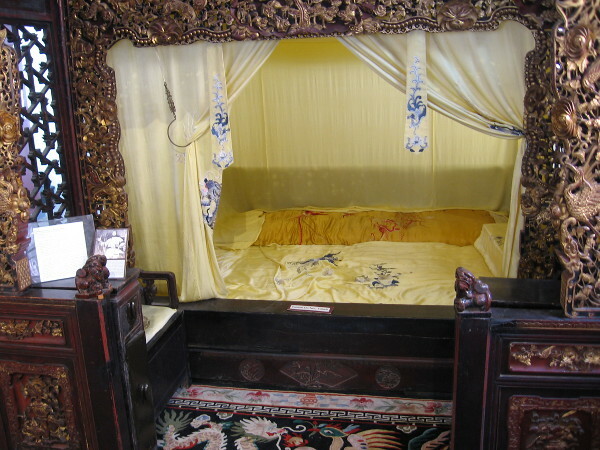 The gilt red-lacquered alcove bed, or babu chuang, was made of southern elm in the Sichuan province in the late 19th century. 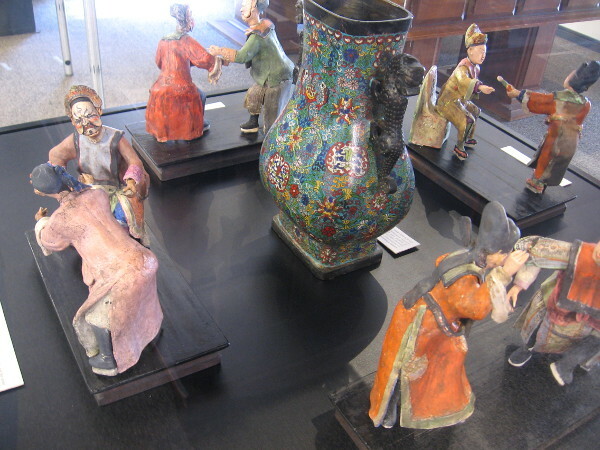 Clay Chinese opera figurines represent different scenes. The characters are from local theatrical traditions, and utilize a complicated set of symbolic gestures. 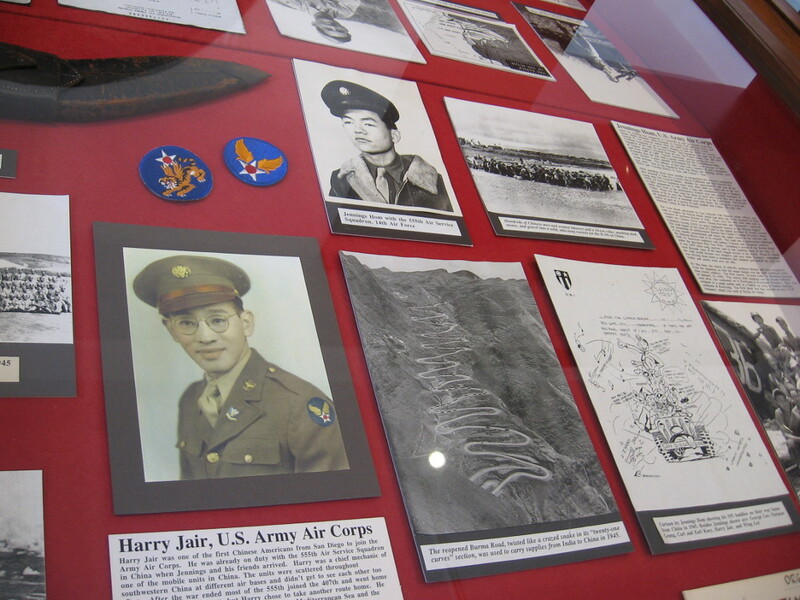 Display case contains memories of military service. 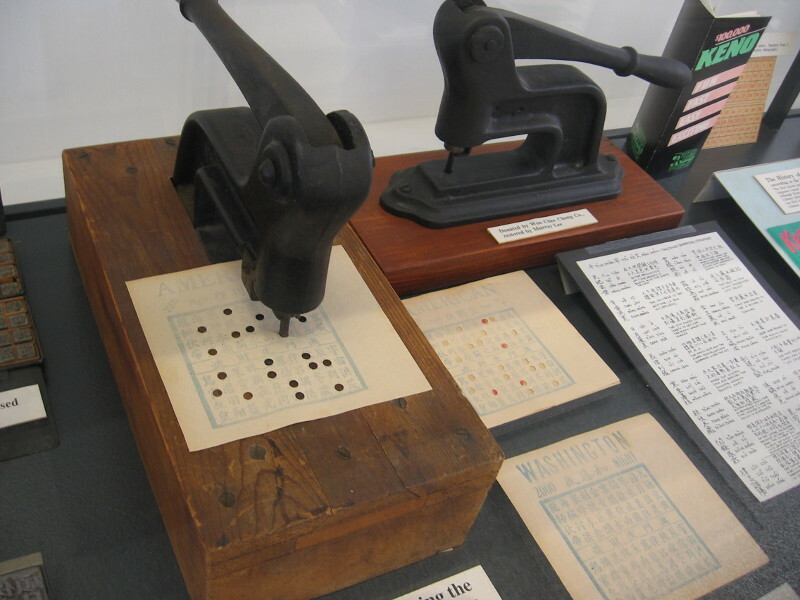 Punching devices used for the Chinese Lottery of San Diego, which was popular in the red-light Stingaree District and Chinatown. Technically illegal, the lottery was tolerated by the authorities. A scene from the Romance of the Three Kingdoms. 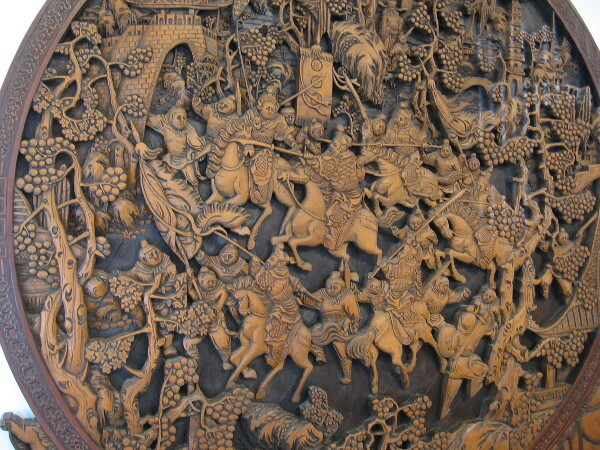 The elaborate wood carving depicts the battle that Zhao Yun fought to save the sun of Liu Bei. 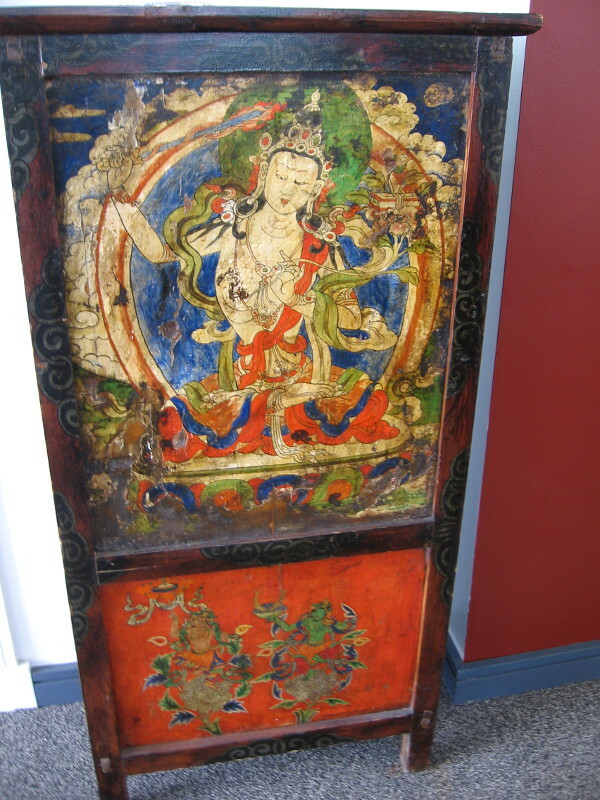 Manjusri altar table, from the late 19th century. Manjusri is the Bodhisattva of wisdom–he holds a sword that cuts through ignorance and illusion. Terracotta horse and general are replicas from the Terracotta Army unearthed at Xian, China. 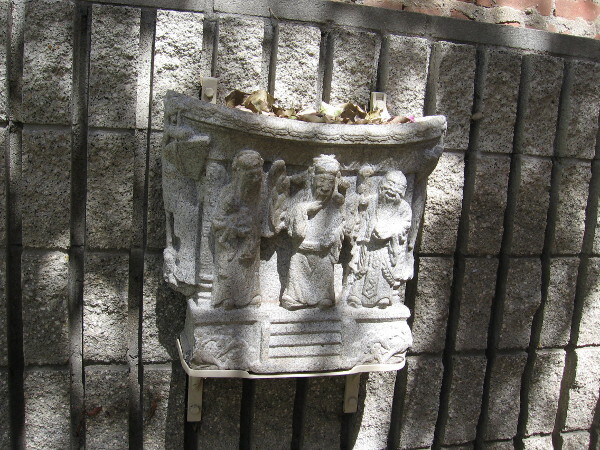 They occupy a corner of the museum’s outdoor Chuang Garden. 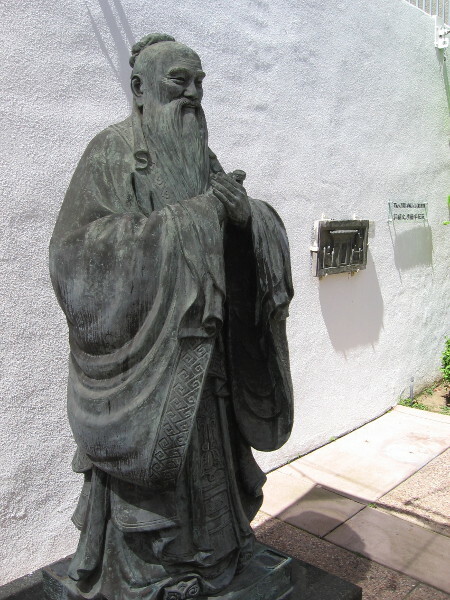 Statue of Confucius, donated by the generosity of the Ministry of Education, Taiwan, Republic of China. A granite courtyard scene, 1800-1840. 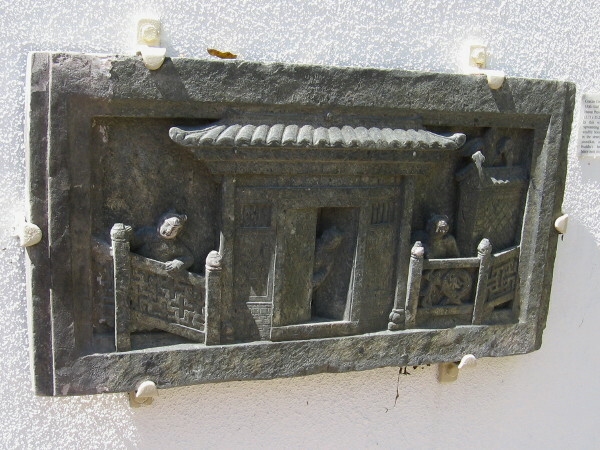 In this wall panel, three children representing prosperity, peer out at the street. 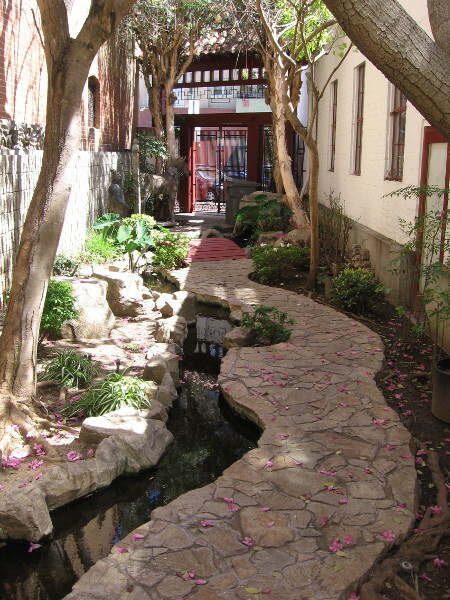 A tranquil path runs beside water along the north side of the San Diego Chinese Historical Museum. Ornamental carving along the peaceful path. Another warrior statue in the cool shade. 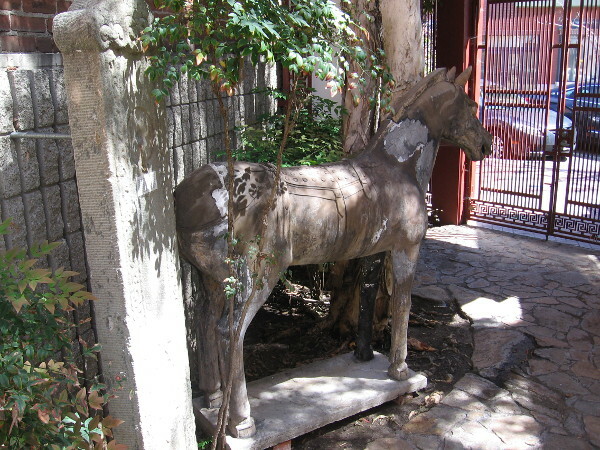 Behind the horse is a tombstone made in 1796, the inaugural year of the Jia Qing Emperor. It lacks in inscription, perhaps expressing a power that no words can describe. If I remember, I think you’re correct! Pingback: Photos from the 2017 Architectural Open House! – Cool San Diego Sights! Previous Previous post: Red Bull Air Race plane flies above San Diego! Next Next post: Reminders that San Diego Comic-Con is coming!